Customer care specialists are sociable specialists who provide specialized support to the customers with regards to their queries on products or services. 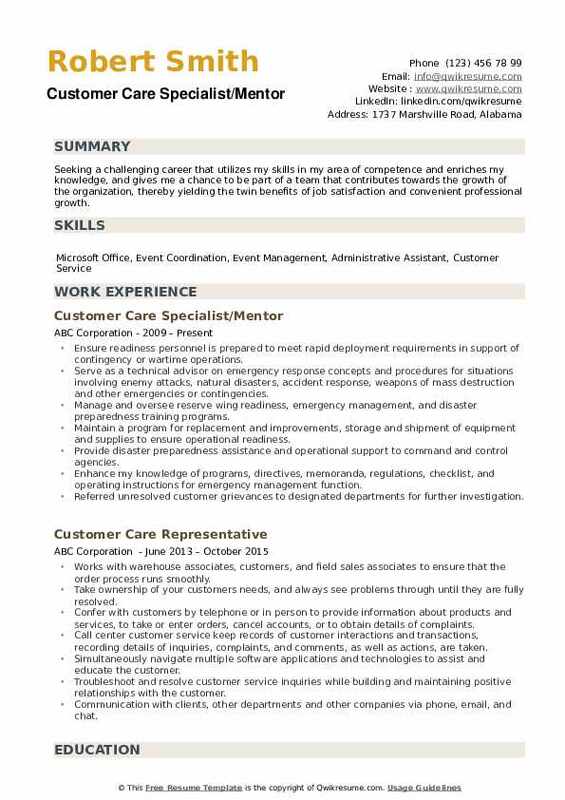 A well-drafted Customer Care Specialist Resume emphasizes on duties such as – giving a clear and professional answer to customer’s request, giving specific information about the company’s product or service or materials; providing troubleshooting information, answering calls and opening and closing customer accounts. 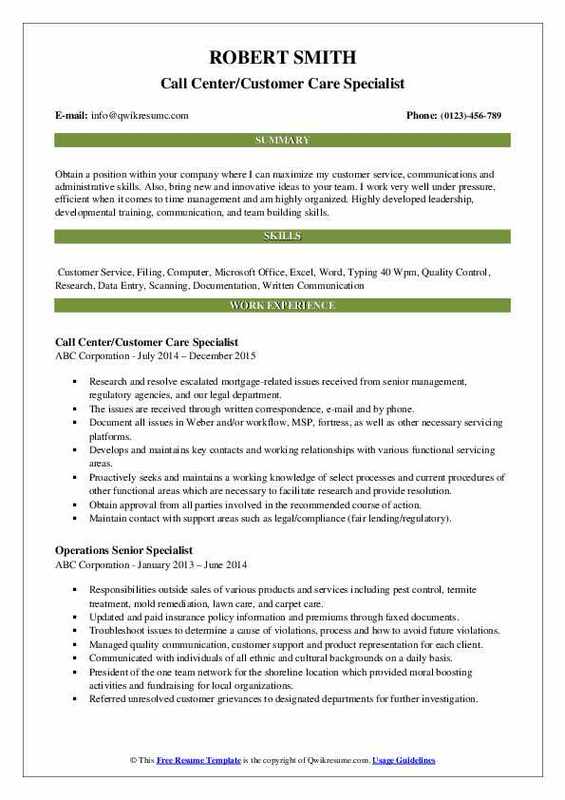 As the customer care specialists act as a direct link between the company and the client, the candidates applying for this post must have a well-developed communication skills, have a thorough knowledge of the company’s product and service, be able to describe the features, functions and details of the product; ability to respond quickly and basic knowledge of MS Office. Most of the CCS’s do not have an education more than a high school diploma. Summary : Dedicated and motivated professional with a strong background in Customer Service, Account Management, and Debt Recovery. Successful experience fostering positive relationships with an array of clients. Consistently recognized for outstanding contributions to the bottom line. Solid reputatiom for resolving complex issues. Dedicated to maintaining a reputation built on quality, service, and uncompromising ethics. Responding to inquiries primarily focused on billing, payment, collections, troubleshooting and outage repair. Demonstrated skill greeting internal/external customers and establishing a rapport while listening, acknowledging, asking pertinent fact-finding questions. Responding to the customers' questions, concerns, and inquiries in a positive professional manner. Understanding the customer's needs and determining a course of action for resolution. Communicating actions and resolutions in terms understandable to the customer. Application of basic arithmetic to compute customer billing validity specifically using subtraction, multiplication, division, percentage, averages, and rates. Maintain service order and trouble ticket report status in various databases. High performer who consistently ranked in top 15 percent of employees for annual performance evaluations. Objective : Seeking a rewarding career, with opportunities for growth development where extensive experience and training can be utilized to deliver professional results. Customer service experience with strong written and verbal communication skills. Strong organizational skills, attention to detail, strong math skills proficiency with a calculator and personal computers. Skills : Microsoft Word, Microsoft Excel, Quick-practice, QuickBooks. 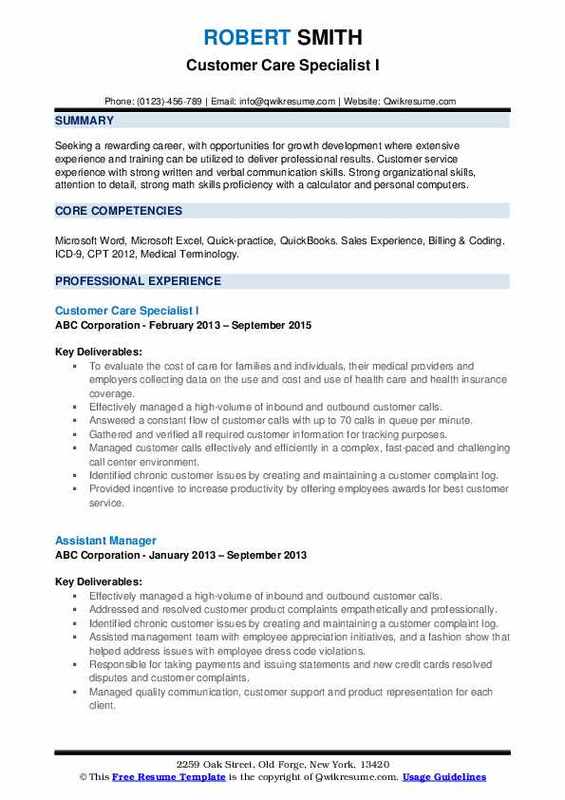 Sales Experience, Billing & Coding. ICD-9, CPT 2012, Medical Terminology. To evaluate the cost of care for families and individuals, their medical providers and employers collecting data on the use and cost and use of health care and health insurance coverage. Answered a constant flow of customer calls with up to 70 calls in queue per minute. Identified chronic customer issues by creating and maintaining a customer complaint log. Served as a liaison for city agencies, professional businesses, civic groups, community organizations and residents. 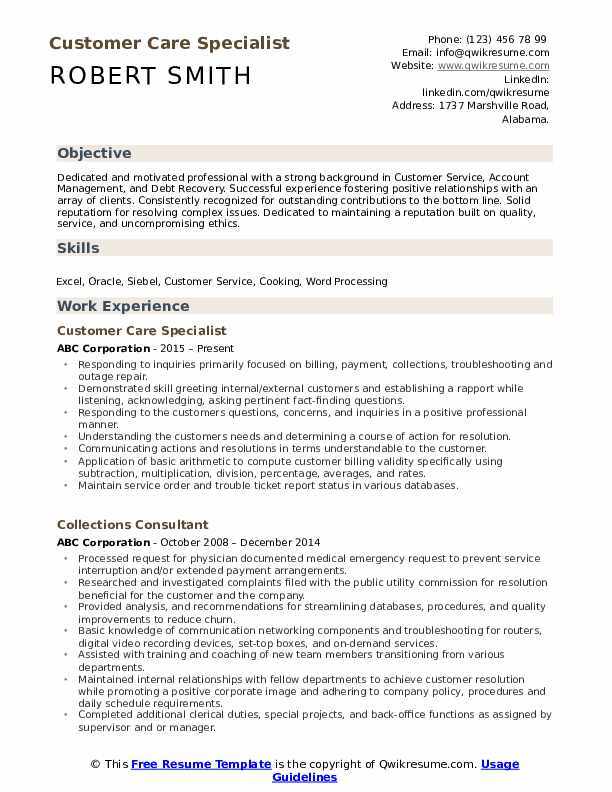 Objective : Obtain a position within your company where I can maximize my customer service, communications and administrative skills. Also, bring new and innovative ideas to your team. I work very well under pressure, efficient when it comes to time management and am highly organized. Highly developed leadership, developmental training, communication, and team building skills. Research and resolve escalated mortgage-related issues received from senior management, regulatory agencies, and our legal department. The issues are received through written correspondence, e-mail and by phone. Document all issues in Weber and/or workflow, MSP, fortress, as well as other necessary servicing platforms. Develops and maintains key contacts and working relationships with various functional servicing areas. Proactively seeks and maintains a working knowledge of select processes and current procedures of other functional areas which are necessary to facilitate research and provide resolution. Obtain approval from all parties involved in the recommended course of action. Maintain contact with support areas such as legal/compliance (fair lending/regulatory). Trouble shoot and resolve customer service inquiries while building and maintaining positive relationships with the customer. 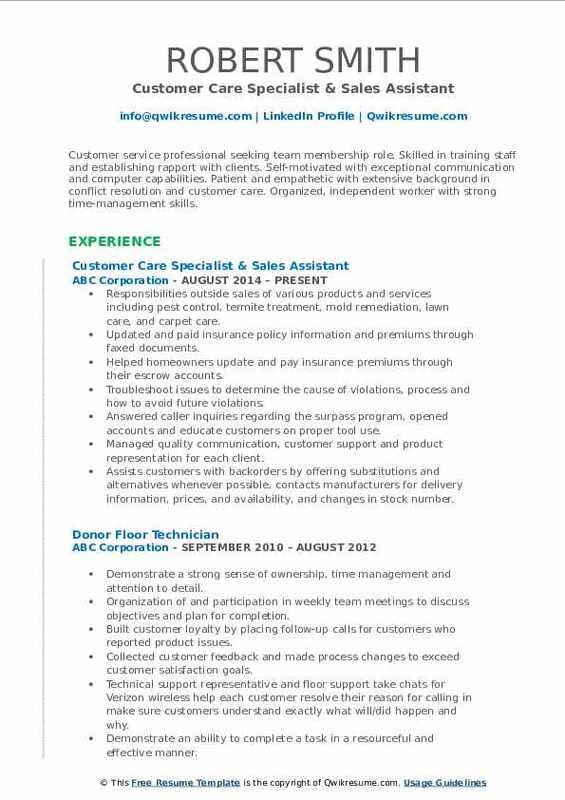 Summary : Customer service professional seeking team membership role. Skilled in training staff and establishing rapport with clients. Self-motivated with exceptional communication and computer capabilities. Patient and empathetic with extensive background in conflict resolution and customer care. Organized, independent worker with strong time-management skills. Responsibilities outside sales of various products and services including pest control, termite treatment, mold remediation, lawn care, and carpet care. Updated and paid insurance policy information and premiums through faxed documents. Helped homeowners update and pay insurance premiums through their escrow accounts. Troubleshoot issues to determine the cause of violations, process and how to avoid future violations. Answered caller inquiries regarding the surpass program, opened accounts and educate customers on proper tool use. Assists customers with backorders by offering substitutions and alternatives whenever possible, contacts manufacturers for delivery information, prices, and availability, and changes in stock number. 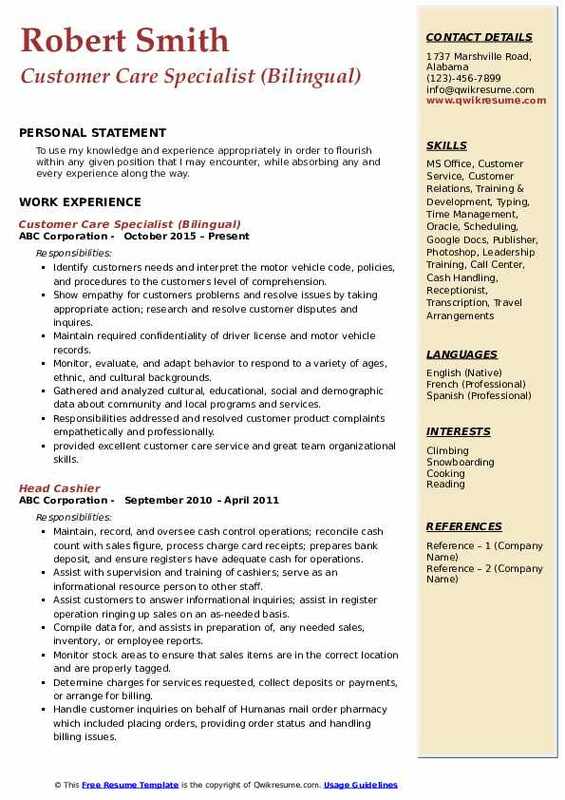 Summary : Looking to obtain employment in a company where growth is available professionally and personally. Seeking challenging opportunities where utilizing my skills for the success of the organization is always obtainable. To succeed in a stimulating and challenging environment that will provide me with advancement opportunities, and knowledge inside and out of the inquiring field that is desired. In which this may help ones self-excel with hard work, perseverance and dedication. Manage customer inquiries for all products and services and ensure timely resolution for the same. Analyze customer inquiries and assist for all services offered by an organization and ensure resolution for the same. 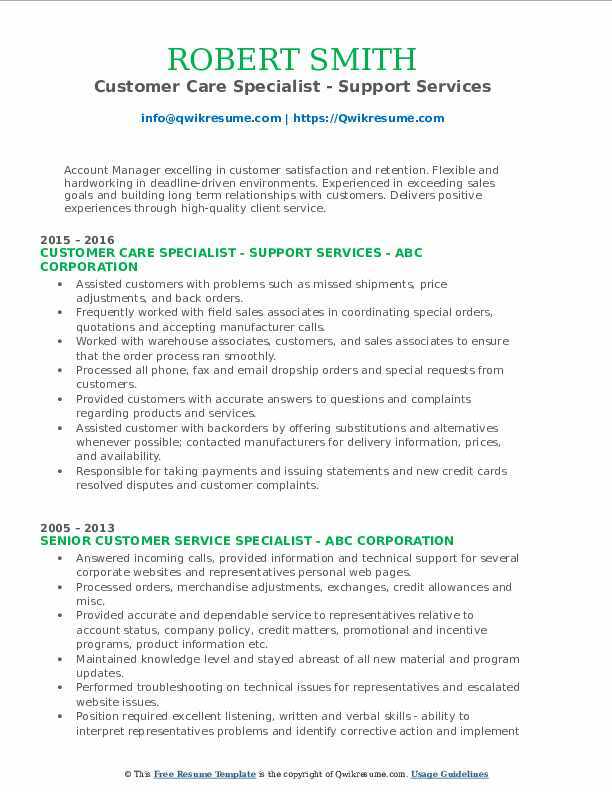 Schedule work for personnel and resolve issues for a customer within a timeframe. Monitor customer care goals and develop improvements in customer care services. Coordinate with various departments and customer and resolve all technical and operational issues. Provide support to customer care applications and ensure satisfaction for same. Analyze customer care feedback and recommend improvements in customer care services. Communication with clients, other departments and other companies via phone, email and chat. 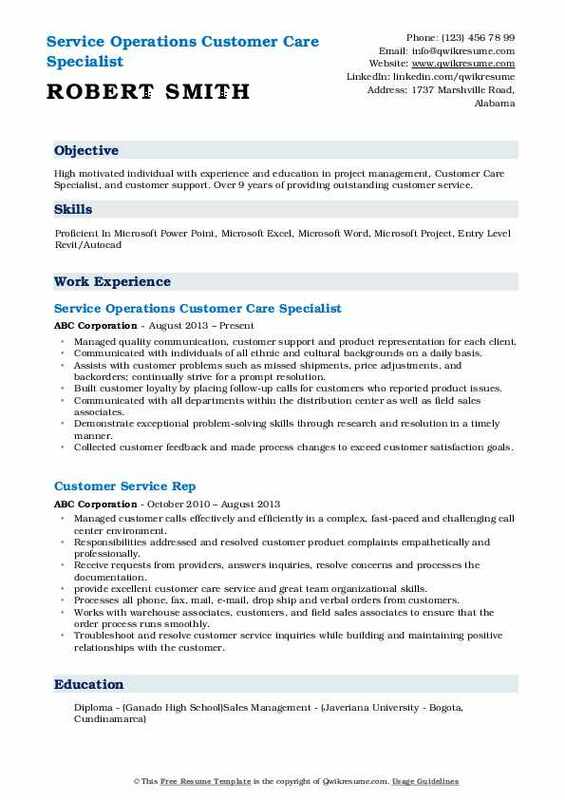 Summary : High motivated individual with experience and education in project management, Customer Care Specialist, and customer support. Over 9 years of providing outstanding customer service. Assists with customer problems such as missed shipments, price adjustments, and backorders; continually strive for a prompt resolution. Communicated with all departments within the distribution center as well as field sales associates. Demonstrate exceptional problem-solving skills through research and resolution in a timely manner. Summary : Account Manager excelling in customer satisfaction and retention. Flexible and hardworking in deadline-driven environments. Experienced in exceeding sales goals and building long term relationships with customers. Delivers positive experiences through high-quality client service. Assisted customers with problems such as missed shipments, price adjustments, and back orders. Frequently worked with field sales associates in coordinating special orders, quotations and accepting manufacturer calls. Worked with warehouse associates, customers, and sales associates to ensure that the order process ran smoothly. Processed all phone, fax and email dropship orders and special requests from customers. Provided customers with accurate answers to questions and complaints regarding products and services. Assisted customer with backorders by offering substitutions and alternatives whenever possible; contacted manufacturers for delivery information, prices, and availability. Responsible for taking payments and issuing statements and new credit cards resolved disputes and customer complaints. 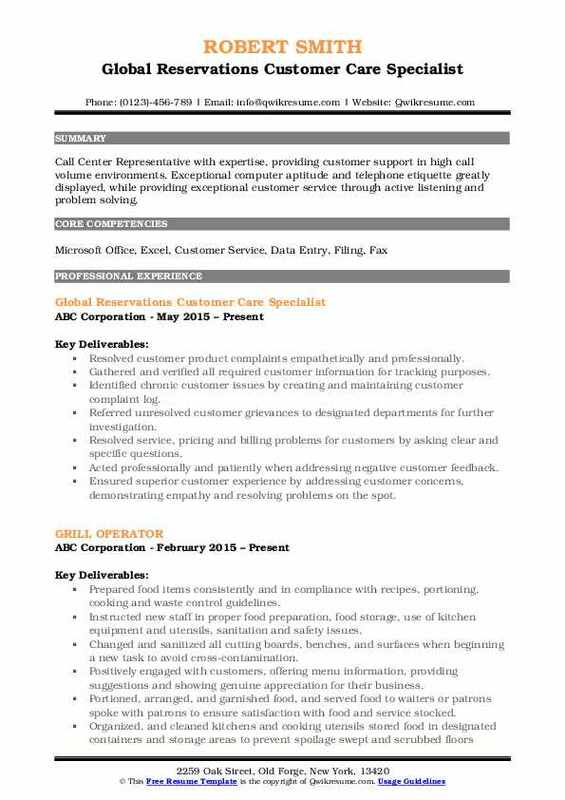 Objective : Call Center Representative with expertise, providing customer support in high call volume environments. 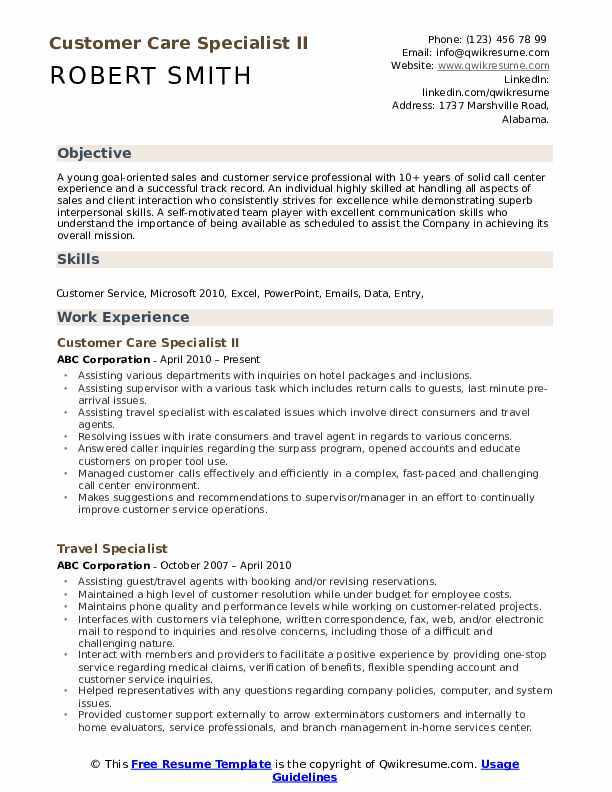 Exceptional computer aptitude and telephone etiquette greatly displayed, while providing exceptional customer service through active listening and problem solving. Resolved customer product complaints empathetically and professionally. Resolved service, pricing and billing problems for customers by asking clear and specific questions. Acts independently and manages own activities with minimal supervision and direction to meet customer needs using sound decision making. Gather information, researches/resolves inquiries and logs customer calls. Summary : To use my knowledge and experience appropriately in order to flourish within any given position that I may encounter, while absorbing any and every experience along the way. Identify customer's needs and interpret the motor vehicle code, policies, and procedures to the customers level of comprehension. Show empathy for customer's problems and resolve issues by taking appropriate action; research and resolve customer disputes and inquires. Maintain required confidentiality of driver license and motor vehicle records. Monitor, evaluate, and adapt behavior to respond to a variety of ages, ethnic, and cultural backgrounds. Gathered and analyzed cultural, educational, social and demographic data about community and local programs and services. Responsibilities addressed and resolved customer product complaints empathetically and professionally. provided excellent customer care service and great team organizational skills. Headline : Seeking a challenging career that utilizes my skills in my area of competence and enriches my knowledge, and gives me a chance to be part of a team that contributes towards the growth of the organization, thereby yielding the twin benefits of job satisfaction and convenient professional growth. Ensure readiness personnel is prepared to meet rapid deployment requirements in support of contingency or wartime operations. Serve as a technical advisor on emergency response concepts and procedures for situations involving enemy attacks, natural disasters, accident response, weapons of mass destruction and other emergencies or contingencies. Manage and oversee reserve wing readiness, emergency management, and disaster preparedness training programs. Maintain a program for replacement and improvements, storage and shipment of equipment and supplies to ensure operational readiness. Provide disaster preparedness assistance and operational support to command and control agencies. Enhance my knowledge of programs, directives, memoranda, regulations, checklist, and operating instructions for emergency management function. 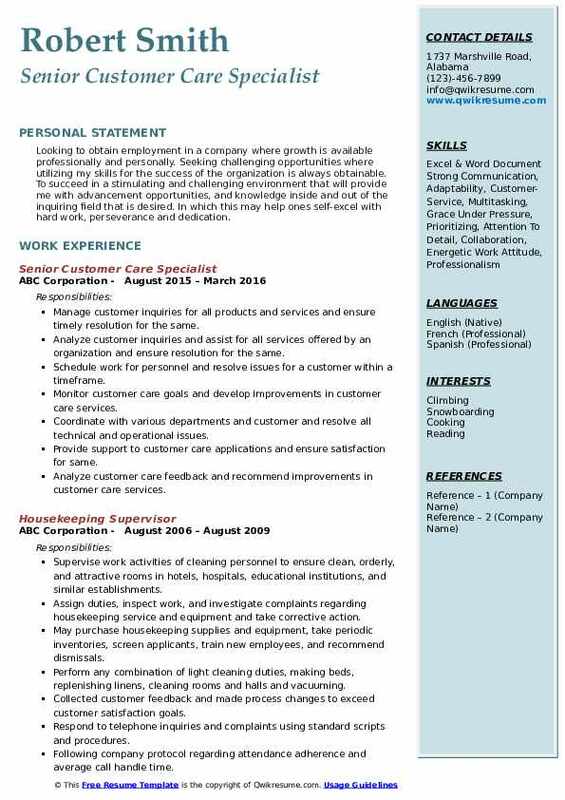 Summary : A young goal-oriented sales and customer service professional with 10+ years of solid call center experience and a successful track record. An individual highly skilled at handling all aspects of sales and client interaction who consistently strives for excellence while demonstrating superb interpersonal skills. A self-motivated team player with excellent communication skills who understand the importance of being available as scheduled to assist the Company in achieving its overall mission. Assisting various departments with inquiries on hotel packages and inclusions. Assisting supervisor with a various task which includes: return calls to guests, last minute pre-arrival issues. Assisting travel specialist with escalated issues which involve direct consumers and travel agents. Resolving issues with irate consumers and travel agent in regards to various concerns. Makes suggestions and recommendations to supervisor/manager in an effort to continually improve customer service operations.